Der Artikel Claudia Gray: Master & Apprentice (Star Wars) wurde in den Warenkorb gelegt. Ihr Warenkorb enthält nun 1 Artikel im Wert von EUR 27,91. When Jedi Rael Averross, another former student of Dooku, requests their assistance with a political dispute, Jinn and Kenobi travel to the royal court of Pijal for what may be their final mission together. 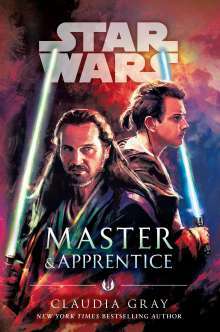 What should be a simple assignment quickly becomes clouded by deceit, and by visions of violent disaster that take hold in Qui-Gon's mind. As Qui-Gon's faith in prophecy grows, Obi-Wan's faith in him is tested-just as a threat surfaces that will demand that Master and apprentice come together as never before, or be divided forever.